Do you want to guess what I did today? Go ahead, guess (I did several things, actually, so the odds aren’t totally against you!)! Yes, I did walk outside (without measurable discomfort) without a coat (and it has been days since I wore gloves), but that isn’t what I’m getting at. Ok, ok, I also had pancakes (which were wonderful and required no shenanigans from me). Give up? Fine, I’ll tell you! 🙂 I drove to the grocery store (without fear for my life upon starting forward motion from a stop due to my still-developing manual shifting skills) ON A SUNDAY (just because I could, not because I want people to have to work seven days a week). And, in addition to pulling a shopping buggy from the corral (which is conveniently located INDOORS) without inserting a coin and having someone bag my groceries (I did bring my own bag, just because I could) and offer me assistance to my car (I declined, as it was ONLY 1 BAG (can you believe they even offered?! ), I made a right on red turn on the way home! Unheard of (and illegal) in Germany… Not only all of that, but on the radio? When the Lumineers went off (love them), Taylor Swift crooned me home. 2 songs, both within the last decade! No, I haven’t found the paradise of grocery-stores in Aschaffenburg; I am still at “home” in Atlanta, where I have been for the last 23 days. It has been a weird 23 days, and I’m not entirely sure of how many more days I’ll be here, nor can I be happy about the reason that I have been here, but I am (now) enjoying being at “home.” Even when I was struggling to keep my head above water (days 3-19), there are definite perks associated with being home. In addition to seeing and hearing from all kinds of people (near and far) who are important to me and more importantly to my sister, spending time with my family, and (I’m just going to say it; I hope it isn’t tacky to put on this list) not wearing a coat in January, I also got to visit with my best friend from (even before) junior and high school! She is one of those people who makes me feel more like me just by being in her presence. I will always be glad that Laura had her heart fixed and at the perfect time for her body (not a minute too soon), but… I’m also glad that it happened when Kelly and her family would be passing through. Definitely a highlight of my year, not just my trip! And… I got to reconnect with a few of my other friends from way-way back, too, which put the icing on a cake that I didn’t even remember the recipe for. ~C.S. Lewis is credited with this quotation, but it is almost the verbatim account of the moment that Kelly and I became friends, all the way back in 1986. We are different in every possible way that doesn’t matter), and alike in most of the rest. It has been, among many other things, truly beautiful. I’ve loved it, even as I hated it. The only real complaint (and that is nowhere close to the right word) I have (even more than the day that the holiday cups disappeared from Starbucks; I actually saw them go away, there one minute, gone the next) is that my love is 4617 (+ or -) miles away. I know… I’m getting tragic. Let me not get tragic. 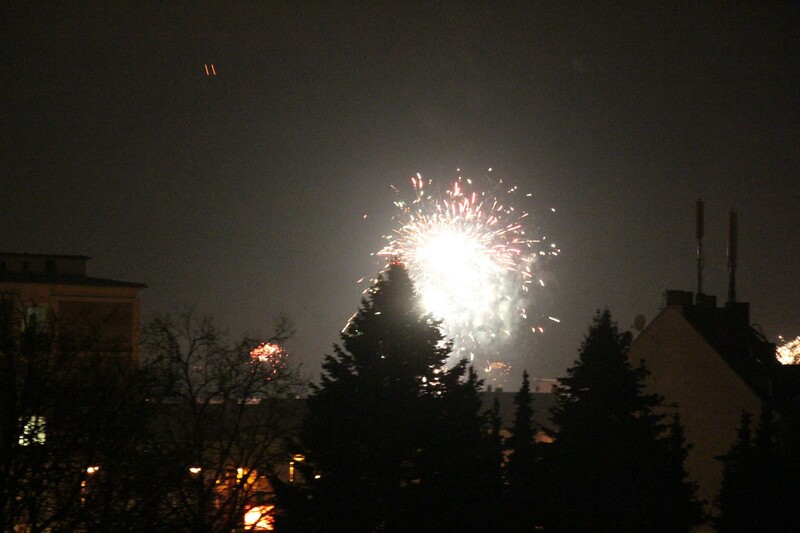 Captured by my sweetie from our apartment in Germany (I was asleep by 8:30pm here in the US) as the year turned 2013 in Europe. * Southernisms used for stylistic effect (in this case only), not for any unintended modeling effects. This entry was posted in Uncategorized and tagged C.S. Lewis, Charles M. Schulz, Downton Abbey, family, friendship, Germany, New Year's, reflecting, Taylor Swift, visiting home. Bookmark the permalink. So glad peace has been restored to your heart and your family. It is good to finally be able to exhale and take life in. Enjoy it. Love your writing, blesses me in many ways. p.s. The Lumineers ARE awesome!! !